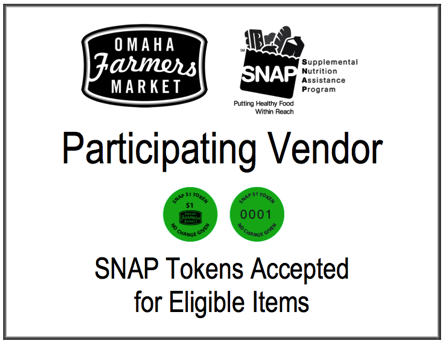 EBT card customers need to start at the Farmer’s Market Information Booth where they may purchase SNAP tokens using their EBT card. The tokens are green and only come in $1 increments. In addition to these SNAP tokens customers will receive FREE MATCHING funds in double up food buck (DUFB) vouchers – dollar for dollar (up to $10 per market day). These matching DUFB funds will come in the form of paper vouchers. EXAMPLE: EBT card customer swipes their EBT card at the information booth and wants $10 in SNAP tokens. The customer will then receive $10 dollars in SNAP tokens and in addition receive $10 in FREE DUFB vouchers. The customer now has received $20 to spend at the market and only $10 was taken off their EBT card! EBT customers are now ready to shop! Customers are only able to select their items from ELIGIBLE vendors. SNAP tokens are ONLY eligible on the following items: produce, meat, baked goods, fruit or vegetable plants or packaged: coffee, tea, jams, jellies, honey, salsa, condiments, spices or snack foods. DUFB vouchers are ONLY eligible on the following items: fresh fruits, vegetables & herbs. They may use 4 vouchers/tokens and 50 cents in cash. They may use 5 vouchers/tokens, but they will NOT receive change. All eligible vendors are required to participate in our double up food buck program, and most participating vendors will have the following sign posted at their booth. If you do not see the sign posted, make sure to ask about their participation before selecting your items. Please note that as per USDA rules, vendors are not able to give change on token/voucher purchases so plan accordingly and consider using a mix of tokens/vouchers and cash. 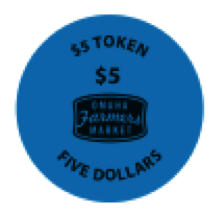 All eligible Omaha Farmers Market vendors are accepting Woman, Infants and Children (WIC) coupons and Senior Farmers’ Market Nutrition Program (SFMNP) coupons as a form of payment. Click HERE to learn more about WIC coupons. Click HERE to learn more about SFMNP coupons. In addition to SNAP tokens, the Market also offers credit or “gift” tokens. These tokens are blue and have a $5 value. The tokens may be purchased at the Information Booth and are meant to be used as gifts or as a way for customers that do not have cash to use credit cards for their purchases. Credit/gift tokens may be used to purchase ANY items, including crafts. Credit tokens are available in $5 increments at the Information Booth. Spend credit tokens like cash at all vendor booths (yes, you get cash back if you need change from the vendor). There is a $1 transaction fee (if you buy one $5 token, your credit card will be charged $6; if you buy ten $5 tokens, your card will be charged $51). Credit tokens can also be used just like gift cards – they make a lovely and unique gift! Credit tokens allow you to keep shopping even if you run out of cash or are purchasing from a vendor that does not accept credit cards. Credit tokens can be used at any of the four markets: Old Market, Aksarben Village, Charles Drew Health Center and Physicians Mutual & WOWT Holiday Market. Please be kind to your vendors by bringing smaller bills and change when you visit the market. Old Market: A Security National Bank ATM is located on the east side of 11th Street between Jackson and Howard Street just outside of the Security National Bank branch. Aksarben Village: A Security National Bank ATM is located just south of the Aksarben Village parking garage at the corner of 64th Avenue and Center Street in the bank’s drive-thru.